On Wednesday July 6th, Henry Jemmott was officially promoted to Superintendent of Police. Jemmott had been acting as Officer in Charge of the Coastal Executive Unit since November of 2016 under the title of Assistant Superintendent. 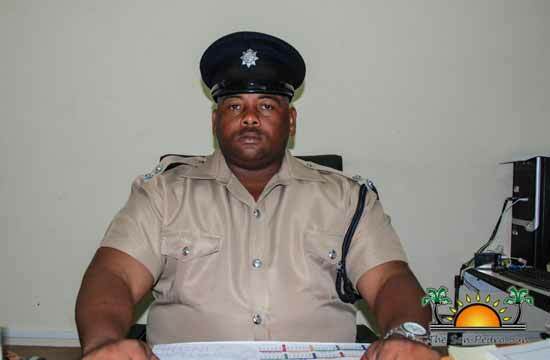 He took over from Superintendent Sandra Bowden after her transfer to the Belize Police Department Headquarters in Belmopan City. Jemmott has been stationed in San Pedro Town since June of 2014, and has been instrumental in the operations and community relations building of the San Pedro Police Department. Originally from Dangriga Town in southern Belize, Jemmott has 17 years of police experience and is looking forward to continue working with the community. “We have been working hard to decrease the crime activities in this area. We are working hard to make Ambergris Caye and Caye Caulker safer for residents and visitors,” said Jemmott. He indicated that there is much work to be done and categorized the crime of burglary as the prevailing crime so far. The new Superintendent also shared some of the strategies being implemented for the upcoming months on the island. “We will be upgrading the Central Intelligence Branch in San Pedro Town, to hit burglaries hard as it is the most common on the island,” said Jemmott. “During these years, we have also removed several weapons from the streets, which help us to curb the incidents of violence. At the same time, we continue with community policing in order to work along with the residents.” Jemmott also mentioned that drug trafficking continues to be an issue on Ambergris Caye. However, they continue aggressively dealing with this matter by conducting searches in different areas of town and in all port of entries to the island.